Armed with clipboards and neon green T shirts, teams spread out during #March4OurLives protests across the U.S.
At combined #March4OurLives events — which drew tens of thousands to march in protest of gun violence across America — nearly 5,000 people registered to vote. Most were younger than 30, said Aaron Ghitelman, communications director of HeadCount, a voter registration organization that registers mostly younger voters at concerts and music festivals. The team at HeadCount used their expertise in crowded and chaotic environments to help people register at the March 30 rallies, including New York City and Washington, D.C.
“When Emma Gonzalez gave that incredible speech that ended with a call to everybody to register to vote, it was like, ‘Okay, what can we do?’” Ghitelman told VOA, referring to youth activist Gonzalez and her classmates, who since surviving the mass shooting at Marjory Stoneman Douglas High School in Parkland, Florida, have driven more youths to participate in politics. While 18 is the age when Americans can vote, they can be registered as early as 16 years old in some states. HeadCount as well as USA.gov offers guidelines on their websites. Ghitelman said a tweet announcing their list of state rules for registration was retweeted more than 20,000 times. "There was a lot of interest in that list,” he said, especially among people who did not know voters could be registered before age 18. HeadCount partnered with grassroots organizations such as HipHopCaucus, Mi Familia Vota, Voto Latino, League of Women Voters, Rock the Vote, Voterise and Fair Elections Legal Network (FELN). He said HeadCount and its partners, armed with clipboards and information sheets about state laws for voters, registered people from 41 states, the District of Columbia, and Puerto Rico. 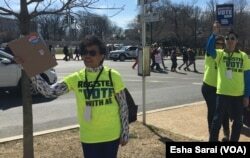 Voter registration teams were out in force during the #March4OurLives across the U.S. According to a study by Tufts university, college student voter turnout increased slightly in 2016 compared to the 2012 election, but still, at 48.3 percent, was less than half of American college students voting. In the 2016 presidential election, however, for the first time, Millennials and Gen X voters constituted a larger share of American voters than the Baby Boomer generation. Voters younger than 52 cast 69.6 million votes in the 2016 general election — a slight majority of the 137.5 million total votes cast, according to a Pew Research Center analysis of Census Bureau data. And that number is something the organizers of the March for Our Lives and many of its attendees are looking to change. “Politicians, either represent the people or get out,” Cameron Kasky, a Parkland student, said in front of the Capitol to hundreds of thousands of attendees of the Washington rally. Some students who traveled to Washington to voice their opinion at #March4OurLives but who cannot vote, urged young Americans who can, to sign up and exercise their rights. Kimberly Salinas and Elizabeth Peralta were brought illegally to the United States when they were young children, but under Deferred Action for Childhood Arrivals (DACA), they are allowed to study and work in the U.S. legally. But, unless they become citizens, they are not allowed to vote. Having traveled from North Carolina with a group of peers for the march, the two spoke between tears about the importance of young people participating in politics. “Here, we are allowed to share our voices,” Peralta, who was born in Mexico, told VOA the night before the march, but shrugged her shoulders when pressed about the right to vote. “It’s better thinking what we can do than what we can’t,” Salinas chimed in quietly. Please visit our Facebook, Twitter, Instagram and LinkedIn accounts for more news about college and university students and issues, thanks!